Lectio Divina, the practice of praying with Scripture, can be an overwhelming task if you don't know where to begin. This is where an easy-to-follow and fit-in-your-pocket guide would be a great resource. Thanks to FOCUS, we now have one. 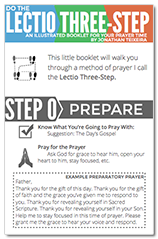 This colorful guide will walk you through the 3 steps of Lectio Divina: Eyes to See, Ears to Hear, and Change to Make. For more information and to print the guide, please click the brochure to the right. For your convenience, there are also copies already folded in the Gathering Space at the Lenten Resource Table.